From the frozen lands of the High Arctic to the scorching streets of Liberia, filmmaker Judith Pyke has never shied away from diverse and challenging locations. 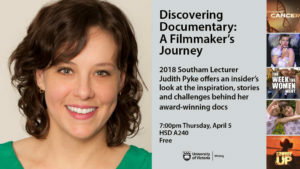 Currently the 2018 Southam Lecturer in Journalism and Nonfiction for UVic’s Writing department, the award-winning documentarian will be sharing her insights and experiences at the annual free Southam public lecture. “Discovering Documentary: A Filmmaker’s Journey Through the Foundational Aspects of Documentary-Making” begins at 7pm Thursday, April 5, in room A240 of UVic’s Human & Social Development Building. Listen to a live interview with Judith Pyke on CBC Radio’s On The Island at 7:20am on Thursday, April 5. Her talk will focus on her two most recent films: Inseparable and Cracking Cancer. Inseparable focuses on a set of conjoined 10-year-old twin girls in Vernon, BC; made for CBC Docs through her own company, Curious Features, Inseparable recently won a Remi Award at the 51st Annual Worldfest-Houston International Film Festival, and has also been nominated for a Golden Sheaf Award in the “Documentary History and Biography” category at the Yorkton Film Festival. 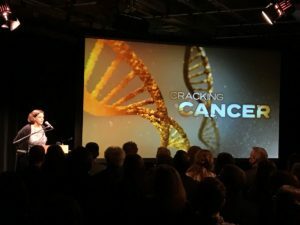 Pyke’s 2017 documentary Cracking Cancer, which she wrote and directed for Dreamfilm Productions, was recently nominated for best direction at the Canadian Screen Awards. But as the Vancouver-based writer-director will share in “Discovering Documentary: A Filmmaker’s Journey Through the Foundational Aspects of Documentary-Making,” her interest in the form goes back to her own days as a UVic undergrad taking writing classes in the early ’90s. As the 11th person to hold this prestigious journalist-in-residence program, Pyke is currently teaching a course on documentary film and television for UVic’s Writing department. She joins a list of fellow Southam Lecturers that includes broadcaster Jo-Ann Roberts, late Indigenous author Richard Wagamese, immersive journalist Terry Glavin, and many others. The Southam Lecturer in Journalism and Nonfiction was established in 2006 and is made possible by a significant gift from one of the country’s leading publishing families. “Discovering Documentary: A Filmmaker’s Journey Through the Foundational Aspects of Documentary-Making” begins at 7pm Thursday, April 5, in room A240 of UVic’s Human & Social Development Building.